Six months after I wrapped up my viewing of the entire Lost series to date, it’s time to check out the Lost season premiere, the first Lost episode I’ve watched as it aired since the first season finale. LA X is a strong episode in a lot of ways, but features a central narrative conceit that seems expressly designed to bring back everything I dislike about the show, creating for a fractured viewing experience that jumps between some really great stuff and some plot developments that even if they lead to good stuff later are just stagnant and tired here in the present. Let me start with the bad, namely the alternate universe conceit, and how it was used here. In many ways, the low point of the series for me is the feels like fifteen minute slow motion shot in ‘Exodus’ showing everybody getting on the plane. There, it was frustrating to spend so much time on this while the plot points on the island moved forward at glacial pace. Here, we get a reprisal of that moment, this time with people actually getting off the plane, plus a bunch of other bad season one rehash stories. I think the greatest misconception the Lost creators have, based on interviews I’m reading, is that season one is still peoples’ favorite. Season one is okay, but nothing compared to the best moments of seasons two or three, and nowhere near the heights the show hit in years four and five. And yet, the central purpose of this alternate universe thing seems to be to let us relive classic terrible stories like Kate on the run from the law or Jack feeling guilty about not fixing people. Other than the Locke/Jack scene at the end of the episode and the surprise appearance of Desmond, every scene in the alternate universe felt like an attempt to “give the fans” something they, or at least I, don’t even want. Most of the series’ great characters were additions to the cast in the later years, the people whose personalities weren’t fit into neat boxes to accommodate flashbacks, and who don’t feel exhausted from overexplanation of their pasts. And, even originals who are still interesting, like Sawyer and Jin, are totally removed from the people they were in those early days. Trying to relive the “glory” of season one is like Radiohead dropping OK Computer or Kid A then coming out and saying that they really want to get back to what they were doing with Pablo Honey. Those episodes don’t compare to the complexity or ambition of season five, and I’m baffled at this point as to why they chose to do this conceit. Now, it may have a larger point in the overall narrative. I’m guessing that they’re going to somehow pull the real Locke out of the alt universe, perhaps after Jack heals him, and then real Locke will do battle with fake Locke. And, that’s a potentially good storyline, but I just don’t have that much interest in the series of disconnected stories that will likely lead there. Every story has to work both in a larger context and in the moment, this might work in the larger context, but in this episode at least, it didn’t work at all in the moment. The potential interesting stories are in finding out why the island is flooded and seeing what Juliet or Ben are up to, but I’m not sure that’s worth the terrible story that’s sure to come in “What Kate Does” next week. I don’t know why the show continually looks backward when the stories are so much more interesting in the present. The reason seasons four and five were so great is that finally every part of the episode was worth watching and we didn’t have the frustrating bifurcated structure. Now, that structural annoyance is back and I find myself wanting to get out of the alt-verse and back to the present day of the islanders. And things are much better there. Over with fake Locke, we get confirmation that fake Locke is the smoke monster, and see another demonstration of his powers. This makes a lot of sense, and goes a good ways towards tying the whole series together. Jacob and this guy (who really needs a name) are locked in an eternal battle to see if the people who land on the island can do good or if they’ll succumb to the fear manifested by the smoke monster. The smoke monster has been shown as being able to manifest as dead people, so the question is raised whether the Jacob that Hurley sees is actually Jacob or if he’s the Fake Locke manipulating Hurley to go to the temple. The show implies that it’s the real Jacob, but it’s possible that it could be manipulation, along the lines of Ben seeing his daughter. Everything on that side of the story was very exciting, and it looks like all our characters will finally be getting reunited soon, now that they’re back in the same time and place. The big question coming out of this is where is Fake Locke’s home. I’ve got no idea on that one, but it’s conceivable it could involve something in the alternate universe. The question remains what was it that split the timeline. In the main timeline, it’s clear that the bomb exploding was what came to be called the incident by the Dharma people. It’s notable that when Desmond triggered the destruction of the hatch, we saw a similar white flash like in the other time jumps. Is it possible that there was a time jump there? I doubt the show would revisit that moment, but it was invoked here in the destroyed hatch site. I’m not sure why, from a dramatic point of view, they chose to have Juliet survive. I loved that final scene with Sawyer, and I can see that she was needed to tell them that the alt-verse exists, but emotionally their farewell in “The Incident” was so raw, this scene, great as it was, can’t compare. I did love Sawyer burying Juliet on his own and forcing Miles to read her. But, bringing Juliet back also reinforced one of my major issues with the show at this point, which is the renewed centrality of Jack and Kate to the narrative. I liked the 70s Dharma stuff so much, and I feel like bringing Jack and Kate in to screw things up there cemented the loathsomeness of the characters that had always been there. We’ve got Jack and Kates making dull storylines in two universes, and the show still seems to hold them up as heroes and sympathetic. The way things have gone, Sawyer has every right to be furious at Jack, and I think those two characters are so toxic at this point, I have no sympathy left for them at all. It’s also notable that in that side of the story, almost all of the new characters are gone, and we’re back to the old, less interesting dynamic. It’s great to have Miles there, but it seems like they’re getting back to the old group of characters, and I’m not sure where he’s going to fit in. But, that said, there was a lot of stuff that I did love in the premiere. A lot of the Sawyer stuff was great, all the Locke/Ben stuff, and also the nature of the temple was awesome. Seeing Cindy the flight attendant was a great surprise, and I loved the Apocalypse Now end of the road feel of their settlement. It felt like this might be where some of the surviving Dharma people went, or perhaps all these people are near immortal, like Richard. I loved that environment, and am eager to see more of it, and I love that the show is still presenting new characters and ideas and worlds at this point in its run. Thinking more about the alternate reality device, it seems designed to prove what Fake Locke says to Ben, that everyone who came to the island wanted to leave, but they’re really better because of it. The plane crash was a new start for people trapped in lives they almost uniformly hated, and that always seemed to be the fundamental flaw of Jack’s plan. Why would Kate agree to go along with it when it meant she winds up back in custody? Why would anyone agree to wipe away the last five years of their life? I’m guessing the realization of the island’s importance in their lives and the fact that it was a curse not a blessing will be key to the finale, and ultimately be the purpose of the alt-verse storyline. So, there’s a lot to like, but also some potential issues. The show is drifting from the things that I loved so much in season five, and does feel more like season one. But, why you would want to go back to the worst season, I don’t know! Maybe I’m alone in this, but if Jack and Kate died and we never saw the alt-verse, and just proceeded with the island stuff and spent some episodes with those temple folk, I’d be happy. Lost, much like Locke, has a good self and a bad self. Will the bad self, the one centered around pop-psychology backstories and beaten to death character arcs for Jack and Kate triumph? Or will it be the good Lost, with interesting characters like Sawyer and Ben and crazy ideas and wildly ambitious conflicts be the winner? We’ll have to watch on and see. 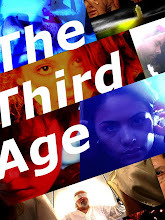 Check out the latest episode of my psychedelic webseries, The Third Age! With one episode to the finale, Zinone finds himself wondering whether he's a prisoner or a guest at Woolf Pharmaceutical! In other news, check back later today for a post about the Lost premiere. I’ve been reading a whole bunch of new comics lately, mostly stuff I’ve been getting out of the library. So, I’ve read a wide variety of stories, and been straying outside of the safe zone a bit and trying to read some new stuff. Two of the big ones I read recently were Warren Ellis’s Nextwave and Geoff Johns’ recent Green Lantern run, up through Secret Origin so far. The two works are polar opposites in terms of approaches to comics, one a continuity laden multi-year saga dwelling in the deepest recesses of the DCU, while the other is a done in one, light fun jaunt through a parody version of the Marvel Universe that explicitly rejects continuity. The generally held belief would be that Nextwave would be much more likely to draw in a new reader and engage them, while Green Lantern would likely confuse and alienate someone new to comics. The thinking is that Nextwave is going to make more comics fans than Green Lantern would, and I don’t think that’s the case, at least when it comes to big two superheroics. One of the most unique things about superhero comics that take place in the DC or Marvel universes is their vast continuity, the fact that each story is the product of thousands of individual issues and choices made by writers many years ago. It’s always exciting to me to see a reference to a story from the past that I’ve read, be it reading about Mon-El in Showcase Presents Titans then seeing him in Geoff Johns’ Superman, or seeing Grant Morrison riff on an Alan Moore Swamp Thing story in Seven Soldiers: Zatanna. The common complaint is that these stories exclude new readers. I think that can be true for certain writers, but when applied successfully, as I’d argue good writers like Morrison or Johns do, the accumulated history of the universe makes for a deeper, more expansive universe. There’s a common misconception that you have to understand every element of a story to enjoy it, but that’s not the case at all. One of the beauties of a film like Star Wars is the sense that behind every corner of this world are other stories, other characters and lives being lived. But, if Star Wars was a comic coming out today, people might complain that we have no idea who Greedo is, or who this Jabba the Hutt that they’re referring to is. But, the thing is, it doesn’t matter, we understand who they are through context clues. The best use of continuity in comics is to make it so that someone who isn’t familiar with the stories can understand it from the context, but someone who is familiar gets the added bonus of being able to connect this story to what’s come before. Just to clarify, I don’t like stories that require you to read another book to understand it, but I absolutely love the way that Morrison and Johns have recurring elements and characters across all their books. It’s fun to see the Squire show up in his new Batman book, and be able to connect her to the JLA: Classified arc, or even his original JLA run. Similarly, in the Sinestro Corps War, we see the further development of Superboy Prime, connecting that story to Infinite Crisis, and laying the groundwork for Final Crisis: Legion of 3 Worlds. The problem I have with a book like Nextwave, or with the original manifesto of Ultimate Spider-Man as a series of self contained arcs is that it gives you no pleasure beyond the moment of reading it. Nextwave doesn’t ask for emotional engagement with the characters, and the characters don’t develop. One of the big pitches of the series is that you can read one arc or all six and still get the same experience. That’s a sentence you could read as a positive, (i.e. you only have to buy two issues!) or you could read it as a negative, that reading ten more issues gives you nothing you didn’t get from the first two. People frequently say that self contained issues and arcs are the best way to hook new readers. I think they may be the best way to get someone who doesn’t want to read comics to give them a try, but it’s not the way you’re going to make new fans. It’s possible to be a casual comics fan, to read Maus and Persepolis and not much else, but most people who get into comics become huge fans. And, the kind of people who become huge fans are going to be the ones who don’t say I read this done in one issue and am satisfied, they’re going to be the ones who read an issue of Green Lantern and want to read years of back issues to catch up and fully understand the story. Particularly with big two comics, but even with ongoing Vertigo series, most major comics fans have a completist kind of personality, a desire to always read more and more, and I think giving someone a series like Green Lantern better activates that desire. When I was a kid, the book that got me into comics was X-Men, I read a few random issues and wanted to know more and more about the world, so I went back and read Claremont’s Essential X-Men 1, then went on and on until eventually I’d read every Claremont book from the 70s to ’91. The reason I became hooked was not because of a successful done in one story, it was getting an insight into this expansive universe and wanting to fully understand it. Even though I think Ellis’s level of craft is better than Johns, and Johns will probably never write a book as good as Planetary, I prefer to read Johns’ work now because it all builds on each other, it’s part of one masterwork within the DCU. Most really big fans of any medium are the ones who want more and more. Casual TV viewers will watch a sitcom or procedural, serious fans watch The Wire and savor every detail, every piece of intricate continuity and consider continuity and complexity a sign of a more mature work. In TV terms, Nextwave is CSI, Green Lantern is Buffy. Now, it’s easy to embrace The Wire as worth your time because it’s socially relevant and something that feels good for you. Is it worth investing the time needed to read 300 issues of Geoff Johns’ comics to fully understand what he’s doing in the DCU? One, I’d argue that he’s skilled enough to make sure you don’t have to read them all, but also, I think it comes down to what you want out a story. Do you want to be entertained and put it down with a complete package, or do you want the promise of more stories to check out? I read Sinestro Corps War and not only wanted to read more Green Lantern, I wanted to catch up on JSA, so I could read Legion of 3 Worlds and then Adventure Comics. I love that all those stories tie together, and I love that each seemingly isolated work builds and enhances the other. And, I’d argue most people who are going to become comics fans like that too. I don’t think you make people fans of comics by hiding them from that which makes them unique. Nextwave might hook certain people, but I don’t think it has that addictive quality that makes people really need the next issue, the next story. That’s what’s going to get people coming back, and I think people are sometimes scared of embracing what makes comics unique and special. Try to enjoy each individual issue, but also enjoy them as part of a much larger tapestry that’s one of the most complex, ever evolving pieces of narrative in the contemporary world.